1/ 1 sheets practice skin and 1 pcs printing paper. 2/ 1 great quality power supply. (work under 110/240V,output15V DC max) we will send the power cord & plug fitted buyer's country .1 Foot switch,1 Clip cord. 3/ 100 ink cup & 1 Cup holder . 4/ 2 pcs High quality alloy Tattoo Machine Grips . 5/ Disinfection 304 Stainless Steel Tip in box . Only we have it , Don't Search it on other Places. 10 different- size Disinfection 304 Stainless steel tips , Size: 3-5R 7-9R 11-14R 16-18R 5M 7M 9M 11M 13M 15M . 6/ A Set of 7 Color DragonHawk Ink . 1. All the pigment neither Layer nor fade . 2. One gram pigment is completely soluble in water, indicating color up very quickly. skin can easily absorb pigment.,no fade after the repair，color is very positive. 3.All pigments sterilized (by gamma rays ) was certificated by a Authority if orders large. Black / Blue / Red / Green / Yellow / White / Lavender. Free Gift a bottle of 2OZ DragonHawk Tattoo Ink (Black). 7/ 50 pre made sterile tattoo needles.(3,5,7,9RL)x5,(5,7,9RS)x5,(5,7,9Magnums)x5. 8/ 1 set of adjust tools and other attachments. 9/ 1 set brush for cleansing . 12/ 2 pc tattoo machine one for lining and one for shading(10 coils wrap) . great quality power supply. (work under 110/240V,output15V DC max) we will send the power cord & plug fitted buyer's country .1 Foot switch,1 Clip cord. 2 pcs High quality alloy Tattoo Machine Grips . 50 pre made sterile tattoo needles.(3,5,7,9RL)x5,(5,7,9RS)x5,(5,7,9Magnums)x5. 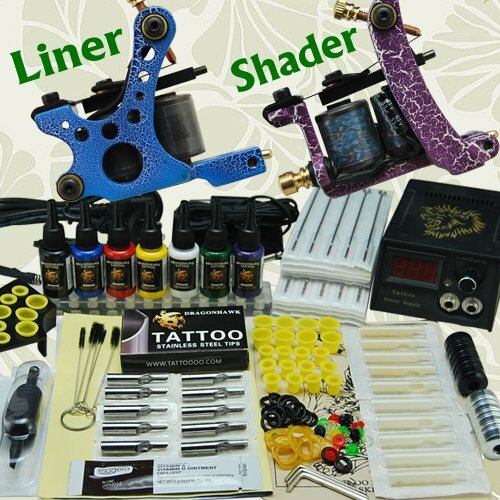 2 pc tattoo machine one for lining and one for shading(10 coils wrap) . If you have any questions about this product by Tattoo-Supply, contact us by completing and submitting the form below. If you are looking for a specif part number, please include it with your message.